With children returning to school HealthDay News reminds us of the basic rules of backpack safety. The first rule as recommended by the American Academy of Pediatrics is to make sure any prospective backpack has wide padded shoulder straps as narrow ones can dig into a childís shoulder, causing pain and restricting circulation. There are several basic factors to consider that will increase the studentís comfort and help avoid unnecessary muscle strains. The back of the backpack should also be padded to protect the child from any sharp objects carried in the pack and to increase comfort. By using both shoulder straps the pack weight will be centered and heavier items should be positioned closest to the center of the back. 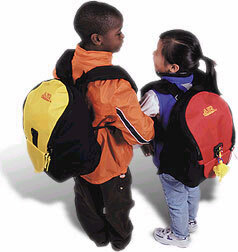 As a general rule the backpack load should not exceed more than 10 to 20 percent of the studentís weight. With a heavier load it is advisable to use a backpack with wheels. However, wheels create transport limitations and must be carried, for example, when going up stairs.